In large bowl, beat cake mix, buttermilk, oil and eggs with electric mixer on low speed 30 seconds, then on medium speed 2 minutes, scraping bowl occasionally. Pour into pan. Sprinkle with chocolate chips; press gently into batter. Bake 35 to 43 minutes or until toothpick inserted in center comes out clean. Cool 30 minutes. Spray meat fork or other long-tined fork with cooking spray. Poke warm cake every inch with fork tines. 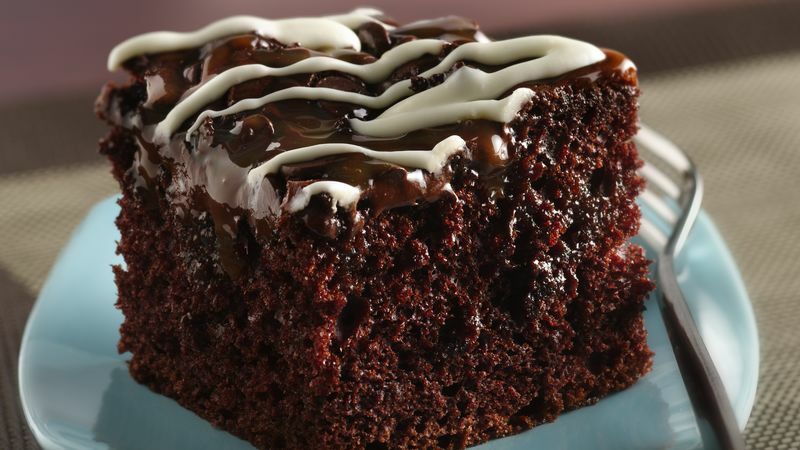 Pour caramel topping over cake. Cool completely, about 1 hour. In medium microwavable bowl, microwave frosting 15 to 30 seconds; stir until very soft. Spoon frosting into 1-quart resealable food-storage plastic bag. Cut tip off 1 corner of bag. Drizzle frosting across top of cake. For easy cutting, dip knife in hot water. Store covered.